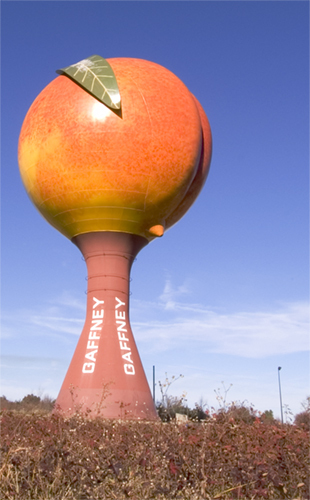 On the way to the mountains for New Year's, I came across this giant peach in Gaffney, NC. Not much in the way of adjustments. Simply removed a bit of the color cast and adjusted the white balance. Cropped the image and that was it. Ah, these symbols of small-town America. Personalized watertowers. I love 'em too. I like the way you showed a suggestion of the dimple in the peach and can only wish the designers made that leaf more pronounced. Nothing you could do about that. ONe thing that does stand out - those utility poles in the background. A few steps one way or the other might have hidden them. But that's not my call. YOu know the terrain. I don't. Message edited by author 2006-01-13 13:35:45. Oh my gosh I want to see this peach in person! Nice shot of an unusual tower. The lighting is flat. It could use more contrast. apart from the use peach i dont think there so many special things about this picture. next time try getting it at a diffrent angle. maybe editing the colors a bit. I'm sure the local teenagers make fun of it but I love things like that -- seems like something from a different era(?). Well-composed. An amusing shape that brings a smile to my face, but lackluster composition and processing both are detracting here. Proudly hosted by Sargasso Networks. Current Server Time: 04/26/2019 09:42:11 AM EDT.